Doesn't it just cheese you off when you have an idea for a blog post, and it just doesn't pan out? Well, this is that post. Or it would have been, if Aunt Goo Shoes (my sister) hadn't come to the rescue. On Wednesday, I had to go into New York City for lunch with a former co-worker, a dentist appointment, and dinner with a friend. 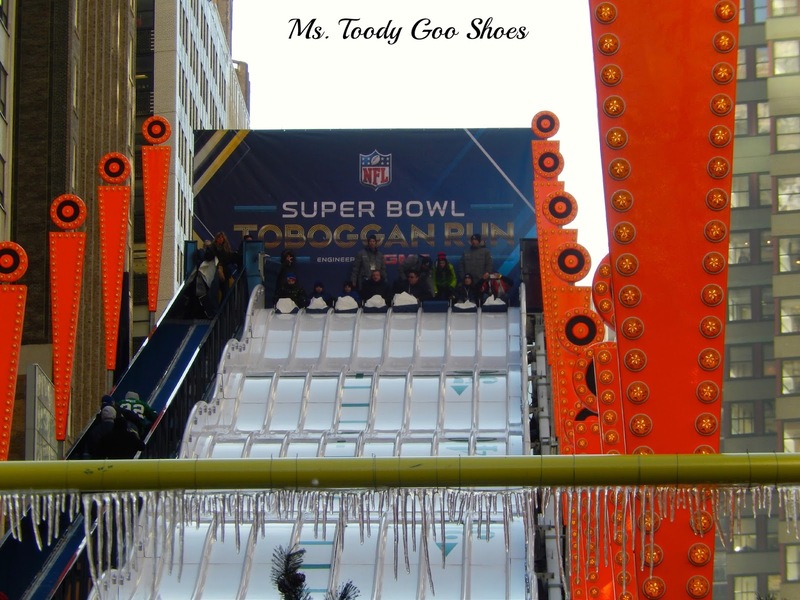 Mr. Goo Shoes suggested that I re-schedule my plans because of all the traffic there would be, due to pre-Super Bowl festivities. 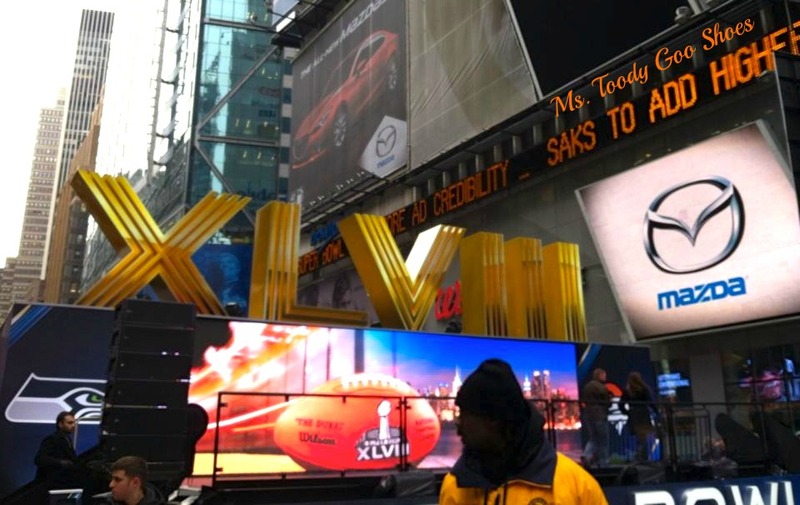 Actually, his suggestion was more like, "you're crazy to go into the city today with that Super Bowl mess...and on top of that, it's Matinee day." 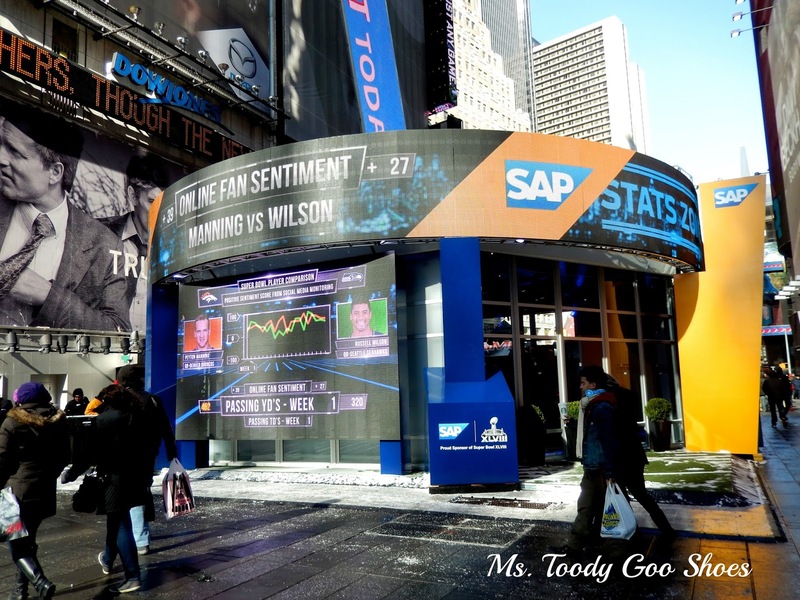 (all of the Broadway shows have afternoon shows on Wednesdays, which usually creates lots of traffic). I had already rescheduled these appointments because of a snow storm, so I didn't want to cancel. I gave myself lots of extra time, and headed in. I made it in 45 minutes. Of course, I had to text Mr. Goo Shoes to gloat. 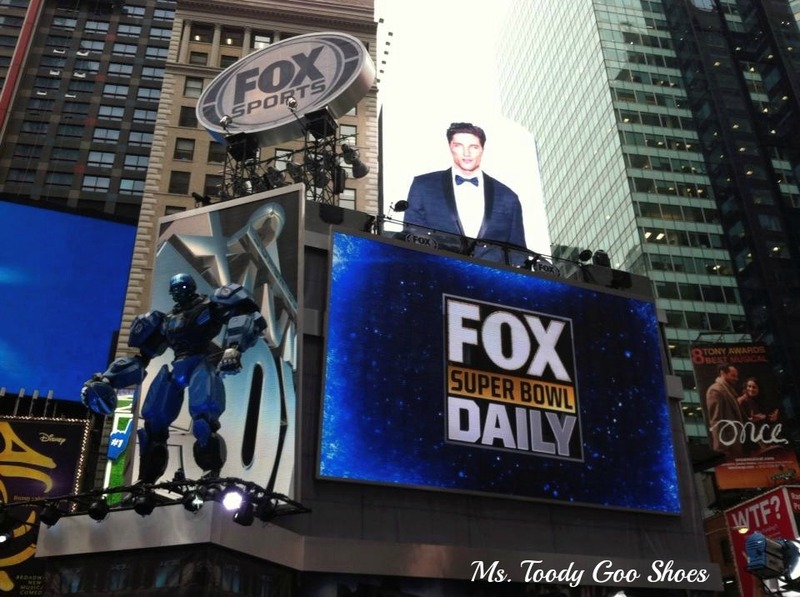 Since I had time to kill, I walked over to Times Square to see what "Super Bowl Boulevard" was all about. 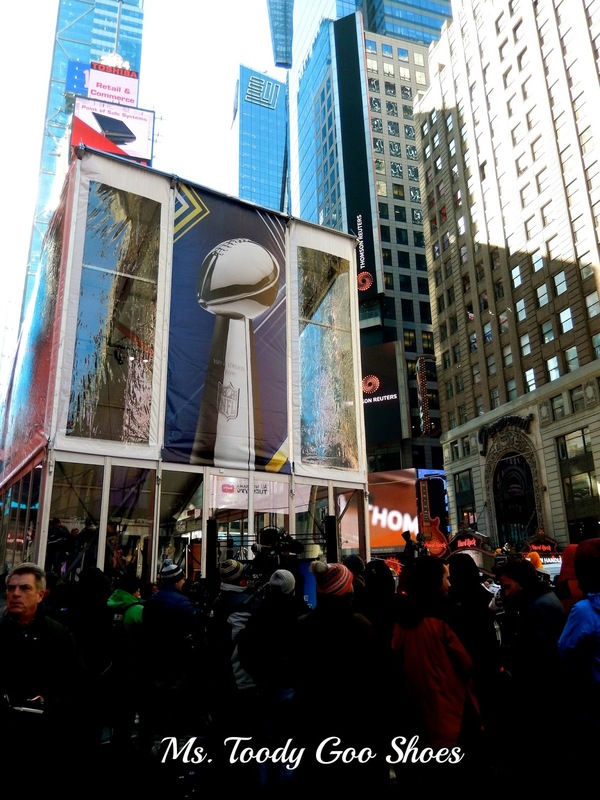 Times Square was turned into a 10-block pedestrian walkway filled with Super Bowl activities. I thought Junior Goo Shoes would like to see pictures of it, and that it would make for a fun blog post. And it would have been, except that most of my pictures were awful. It was about 15 degrees, and my fingers were so frozen, I could barely push the shutter. 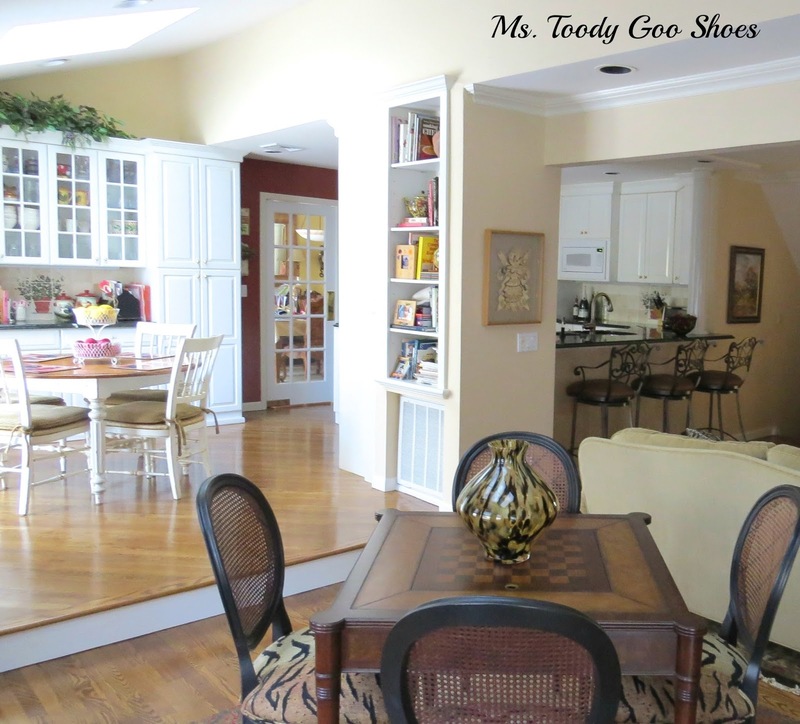 That is, until I saw Aunt Goo Shoes' photos on Facebook tonight. mostly courtesy of Aunt Goo Shoes (a few photos are mine). 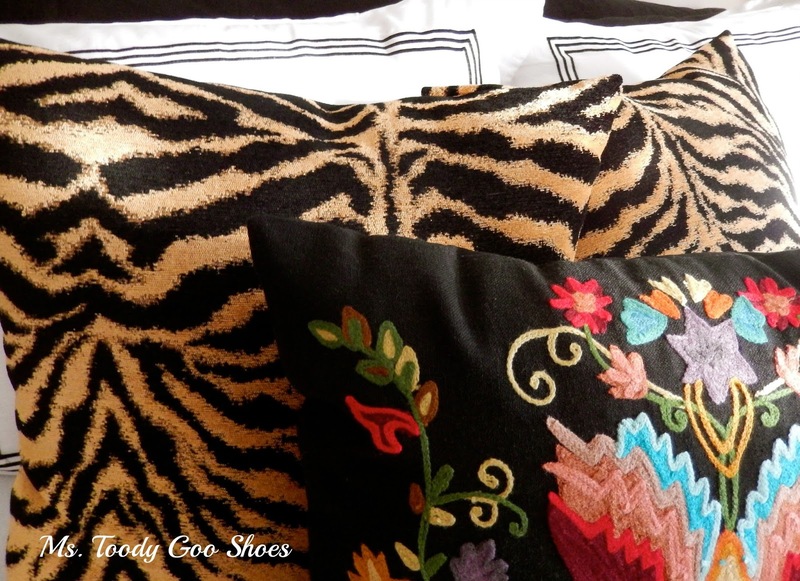 Thank you, Aunt Goo Shoes! I think this is the fastest post I've ever written. There's only 2 days until Super Bowl, so I had to crank it out quickly. Which reminds me. There's not much time left to enter the Super Bowl of All Giveaways. You've got until just before kick-off at 6:30pm EST on Sunday, so don't forget to enter! When you look at your To-Do list, do you tend to tackle the harder projects first, or the easiest? I usually like to get the tougher ones out of the way, but honestly? I've been having a hard time getting motivated. 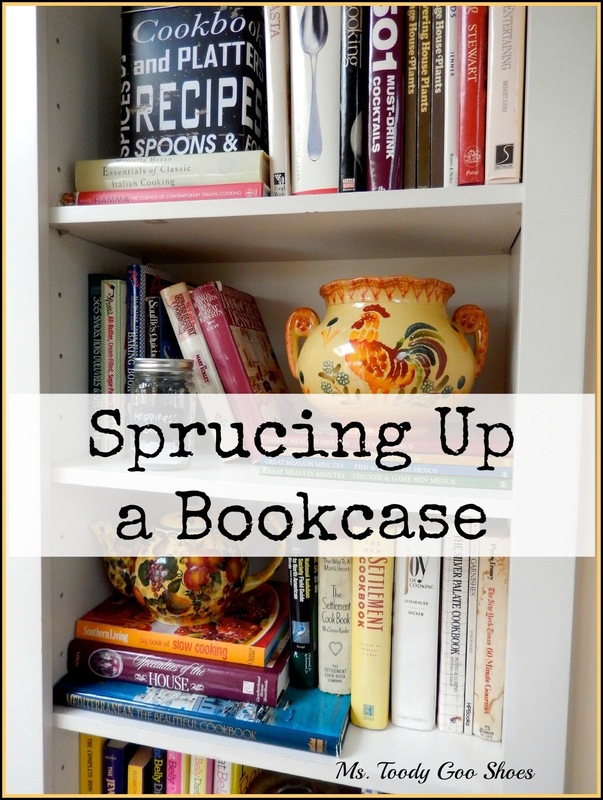 I decided to start with an easy one -- sprucing up my bookcase -- to see if that would jump-start my motivational engine. ...and I truly had no idea what was on the shelves anymore. 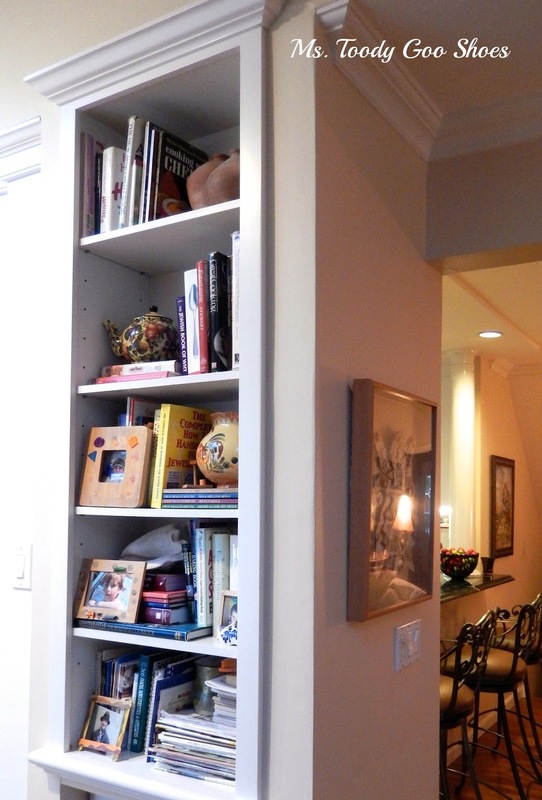 Plus, the book case is practically in my family room, so it's right there for everyone to see. ...displaying some of Junior Goo Shoes' early artistic endeavors...a gigantic conch shell I found on the beach in the Caribbean...a stack of old magazines...and lots of other stuff. It wasn't awful...just sloppy, and unattractive. It was time to toss, straighten, and style. 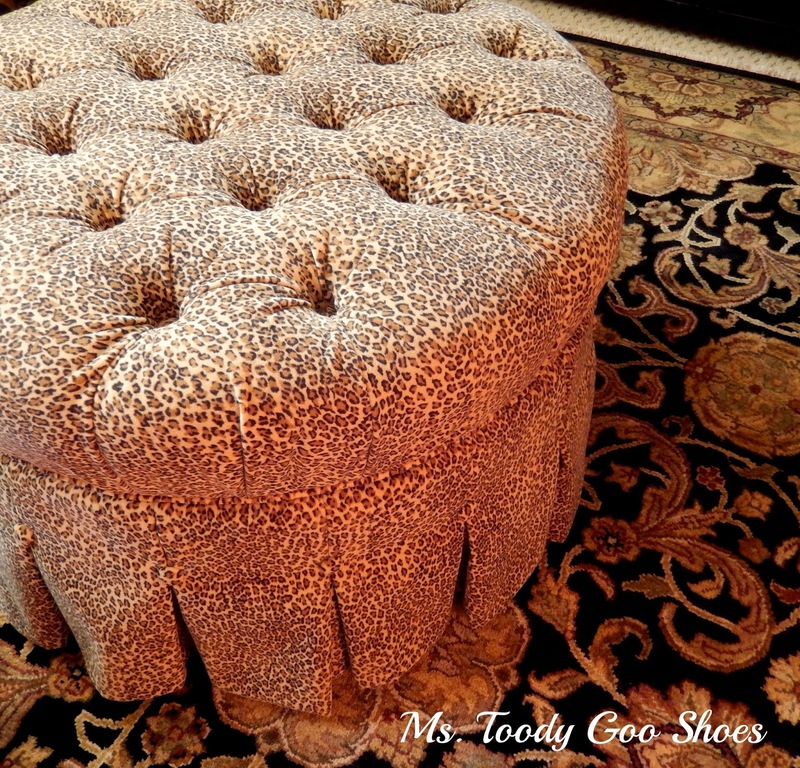 I got rid of a bunch of stuff that seemed obsolete, found another spot for the magazines, put Junior Goo Shoe's artwork in a keepsake box, and stowed the giant shell till summer. 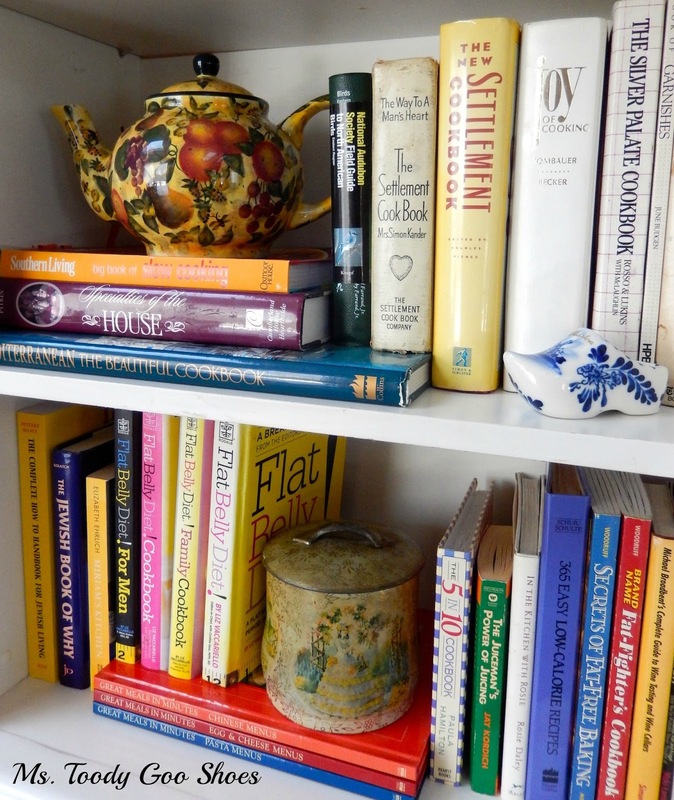 The books were re-arranged in a more attractive way, and I was able to fit in some cookbooks that I do use frequently, that were previously living on my kitchen counter. 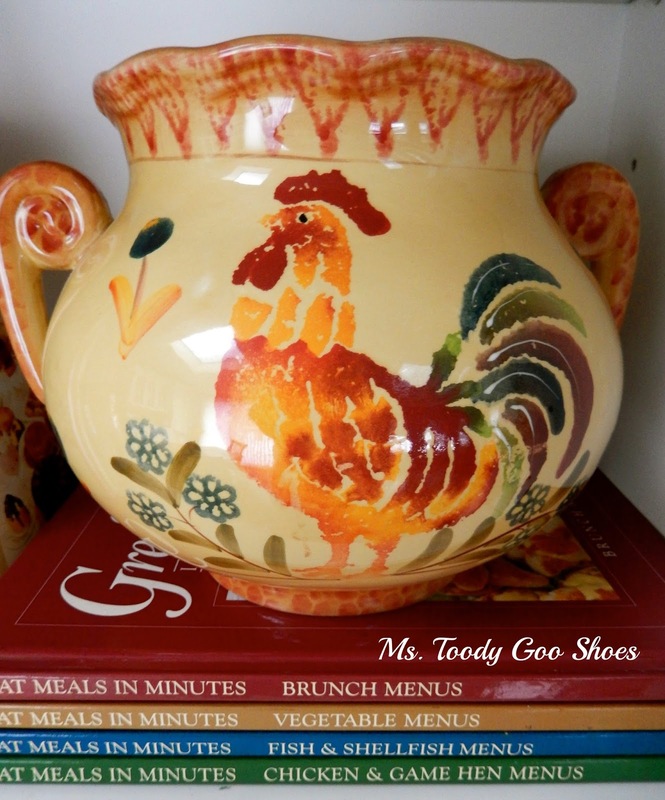 I like the pottery, so that stayed. 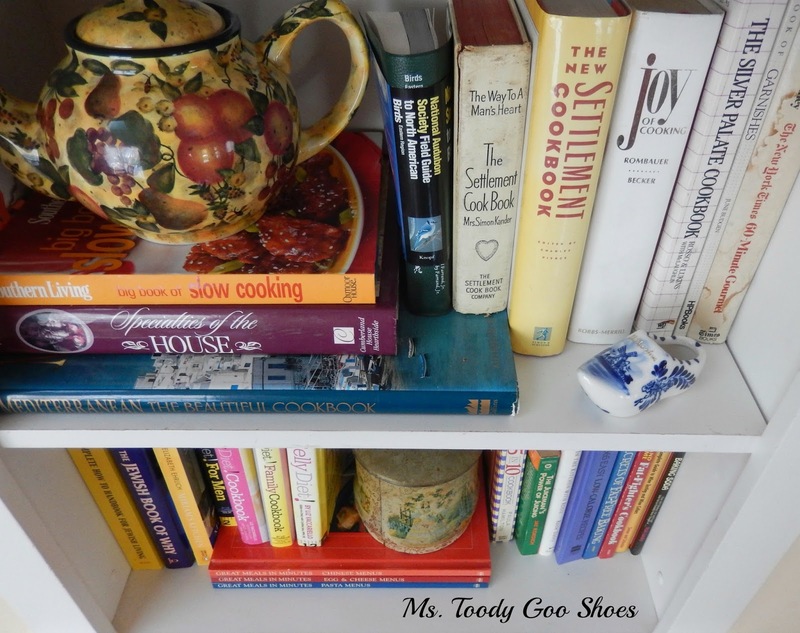 The tin on the bottom shelf was Mr. Goo Shoe's grandmother's. 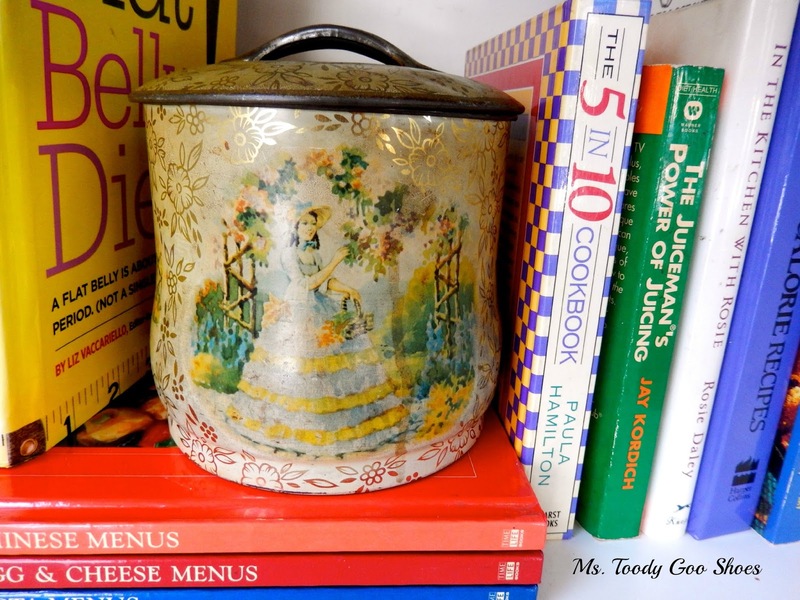 He remembers taking cookies out of it when he was a little boy, so how is that for a tie-in to my baking cookbooks? 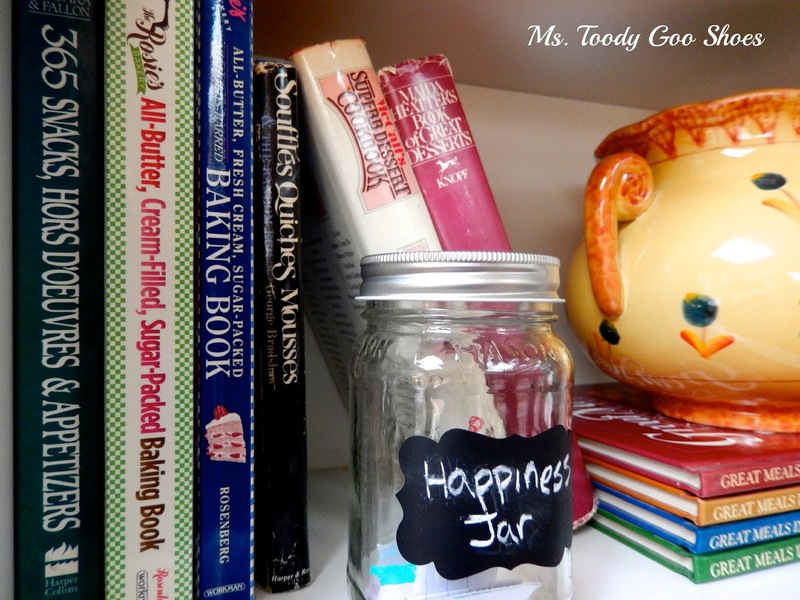 I found the black and white "Recipe" tin at Home Goods, and added that to the mix, along with our little "Happiness" Jar. 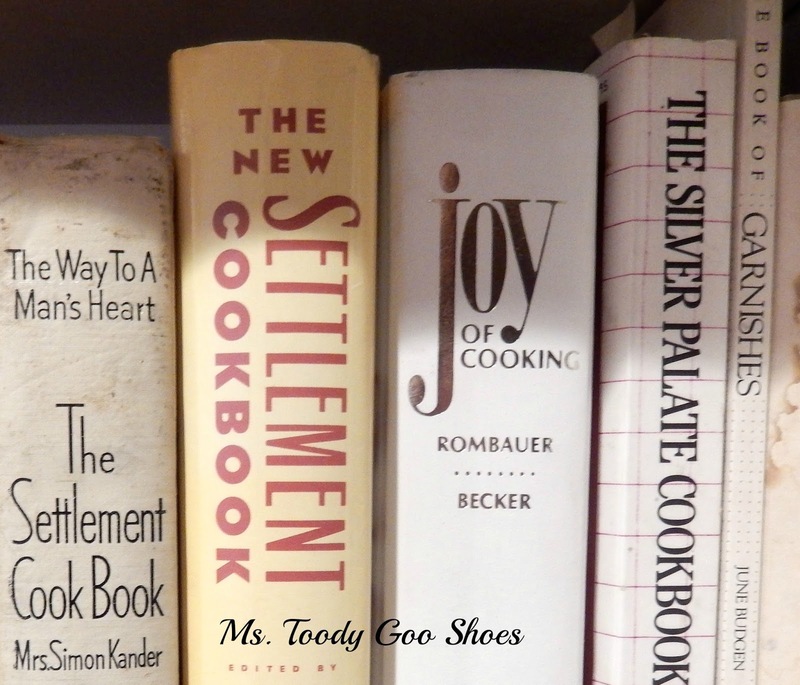 "Ms. Toody's Life in Cookbooks." Decades of food phases and trends were sitting there on the shelves. "The Way To A Man's Heart." Funny how they left that off the updated version. I guess they got a few too many letters over the years from women wanting a refund! 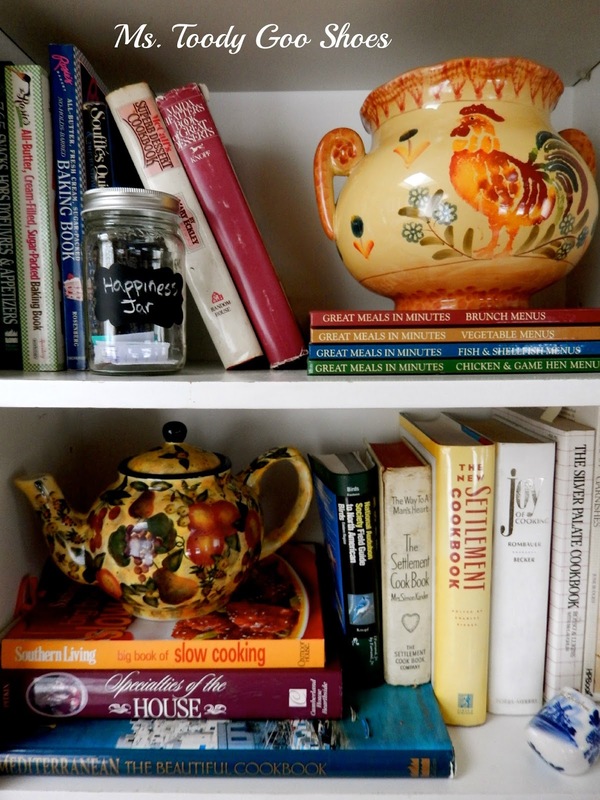 That started my cookbook crush. I couldn't resist them. You'd have thought it was my destiny to become an awesome cook. Just ask my family how awesome a cook I am, and they will surely snort milk out of their noses from laughing so hard. 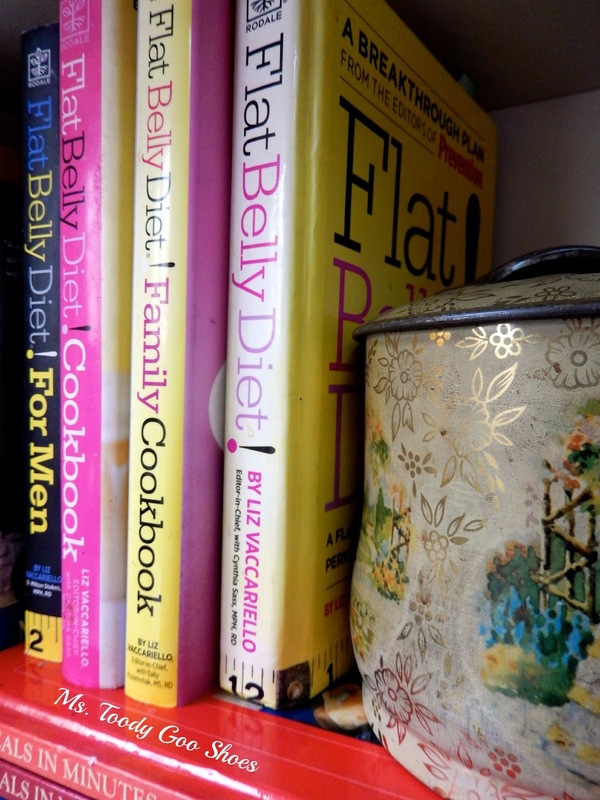 If my cookbooks could talk, they'd tell you that in the '90's, I was big into the Fat Free craze. I churned out some of the most awful, tasteless, rubbery dishes you've ever seen. And I ate them. I made Mr. Goo Shoes eat them. He was a sport about it. Usually. What was I thinking? Fat Free Baking? Blechhh!! After a few years of fat deprivation, I did a complete reversal and bought Rosie's All-Butter, Cream-Filled, Sugar-Packed Baking Books. I wanted to swim in a bowl of real butter and egg yolks. They are still my favorite baking cookbooks. 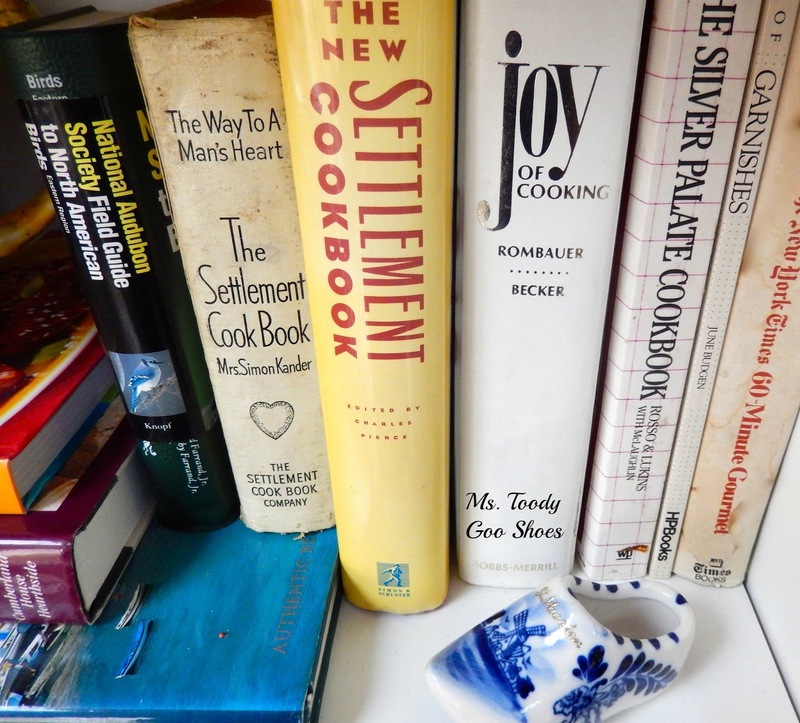 My Silver Palatte and New York Times cookbooks would clue you in that while I was living in New York City, I only wanted to cook like a "New Yawkah..."
...And my souvenir cookbooks would tell you where in the world I traveled to. You'd understand my work/life balance struggles by my stack of Great Meals in Minutes series: Rush home from work and get meals on the table quickly! 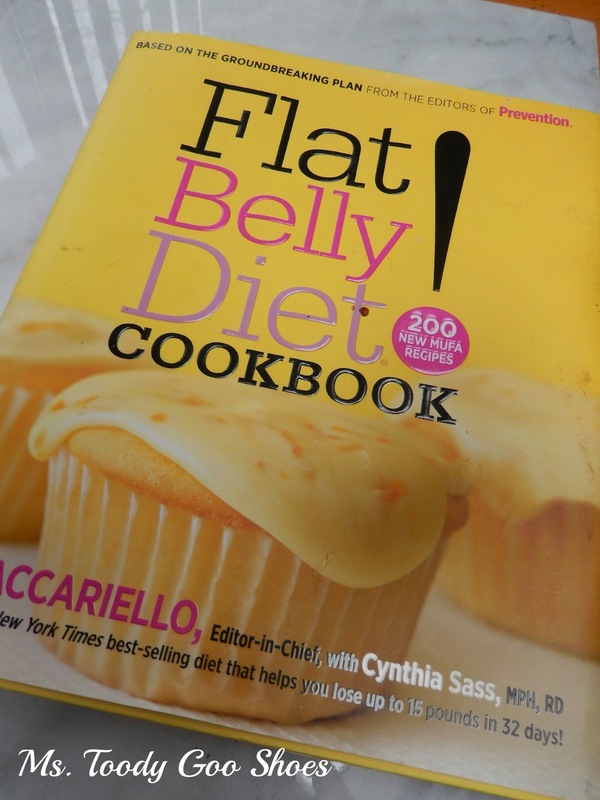 My cookbooks would tell you that I've been through a few health kicks - Juicing, Fit For Life, and my faves for the past few years - The Flat Belly Diet (any diet that encourages chocolate is a friend of mine). 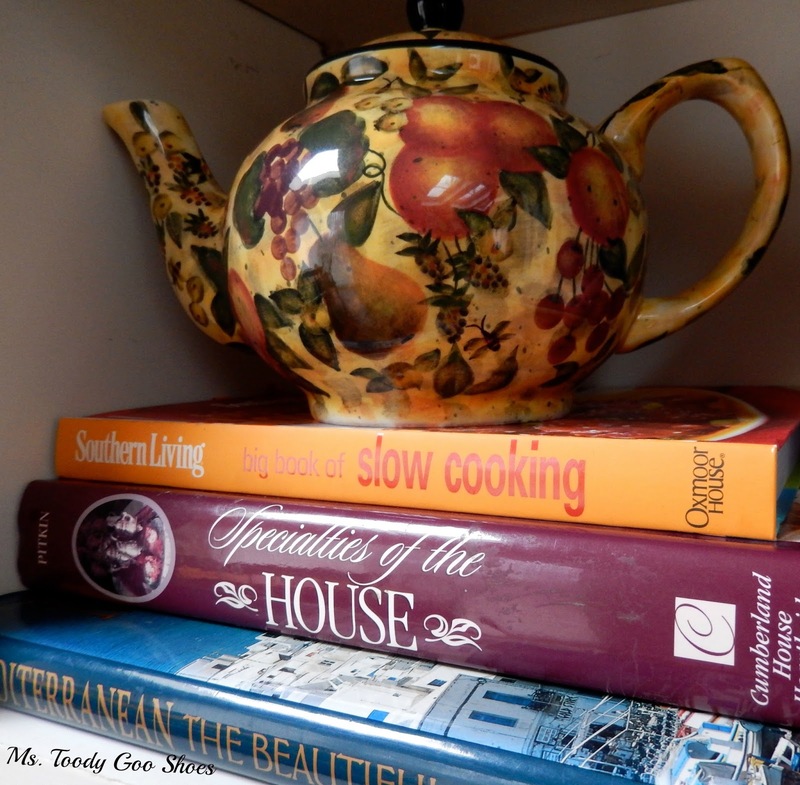 Finally, if my cookbooks could talk, they'd tell you my latest obsession is with Slow-Cooking, which is the best thing to happen to cooking since take-out. 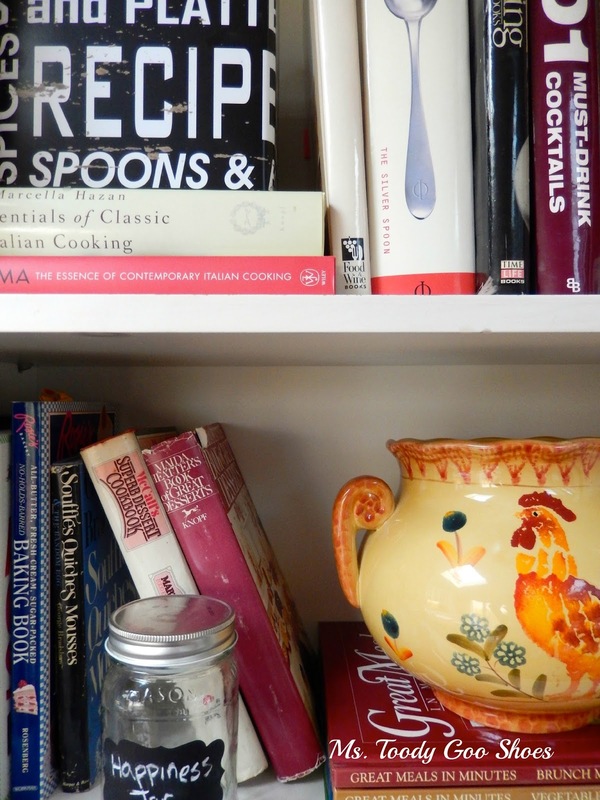 But there is one thing my cookbooks would not tell you. Somewhere along the way, it occurred to me that I didn't really like cooking at all. 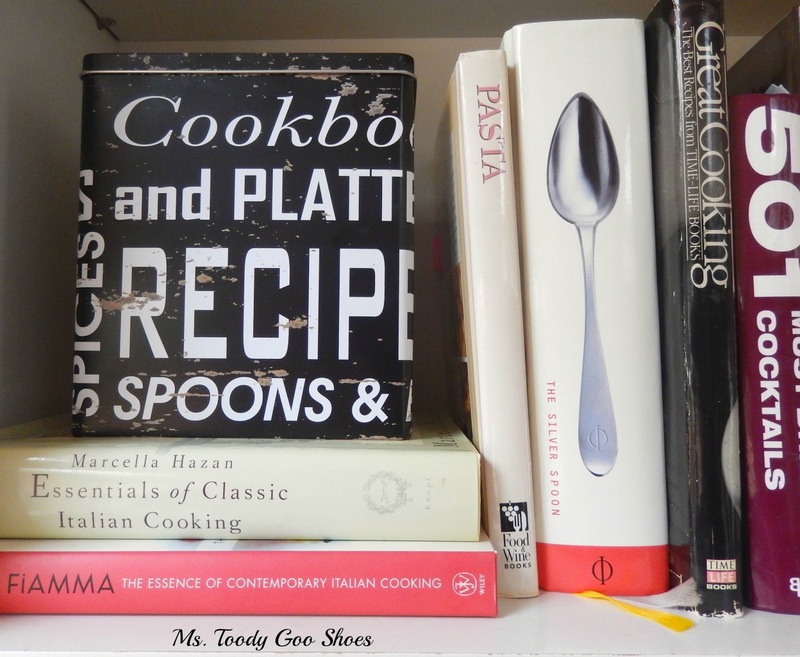 But still, when it came to cleaning up my bookcase, I wasn't prepared to part with my cookbooks, even though many of them don't get used anymore. 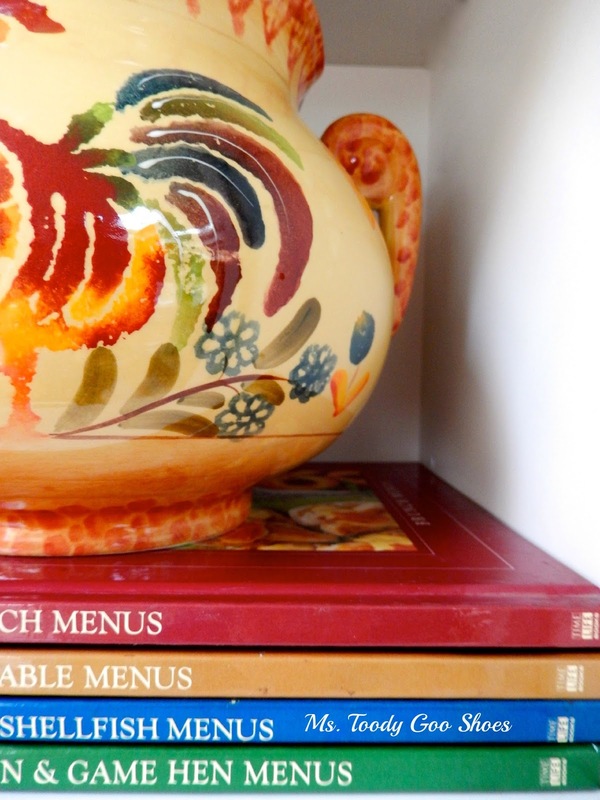 With Pinterest and the like, I'm afraid cookbooks may soon become extinct. 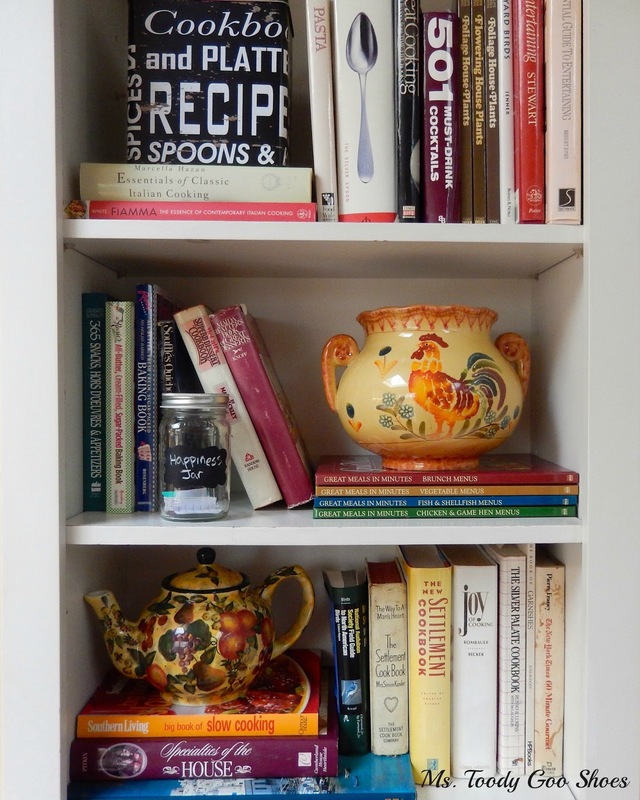 Sprucing up my bookcase may not have motivated me to tackle my next project, but it did inspire to revisit some of those old cookbooks. The SUPERBOWL OF ALL GIVEAWAYS -- $500! 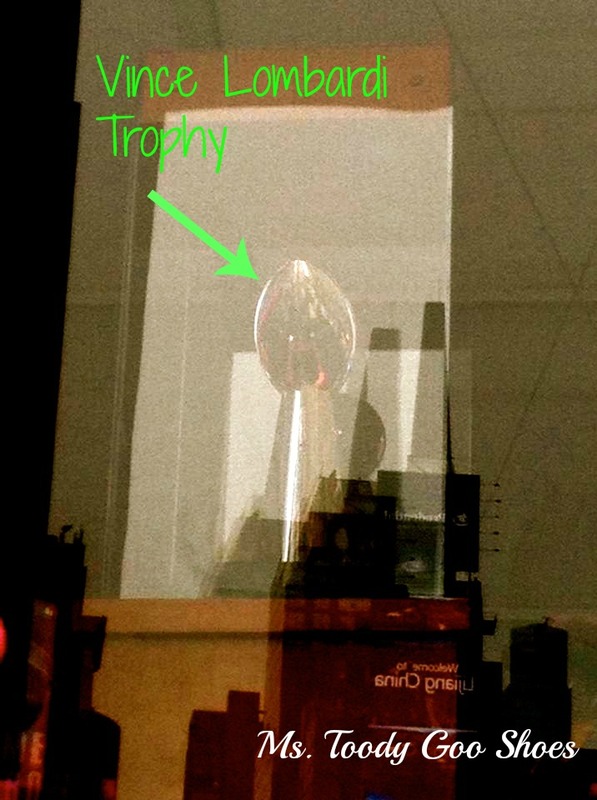 THE SUPERBOWL OF ALL GIVEAWAYS! 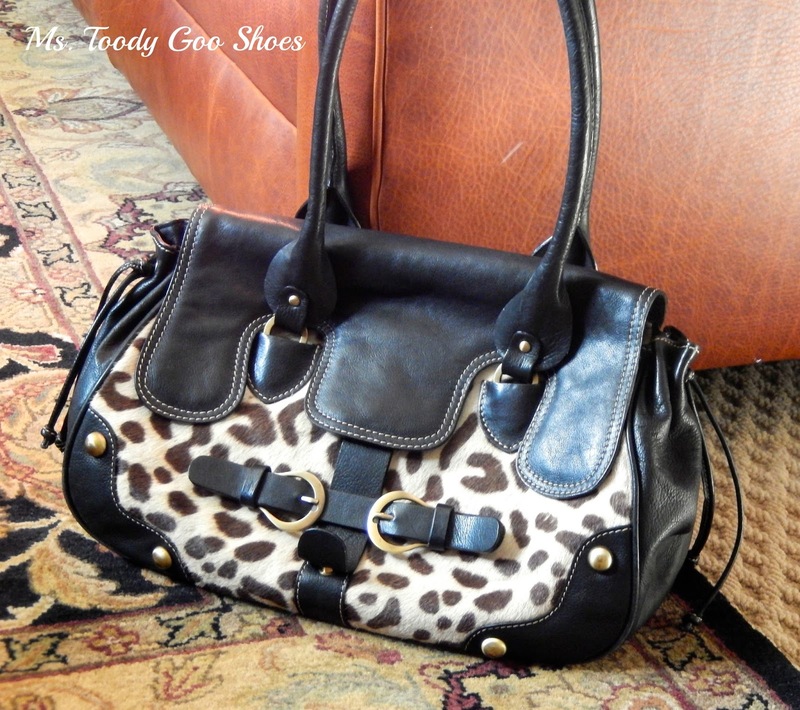 That's right, I'm talking about a $500 giveaway! I've partnered with a great group of bloggers to offer you the chance to win $500 in PayPal cash! The giveaway kicks off right NOW and runs until just before game time -- 6:30pm EST on Sunday, February 2. 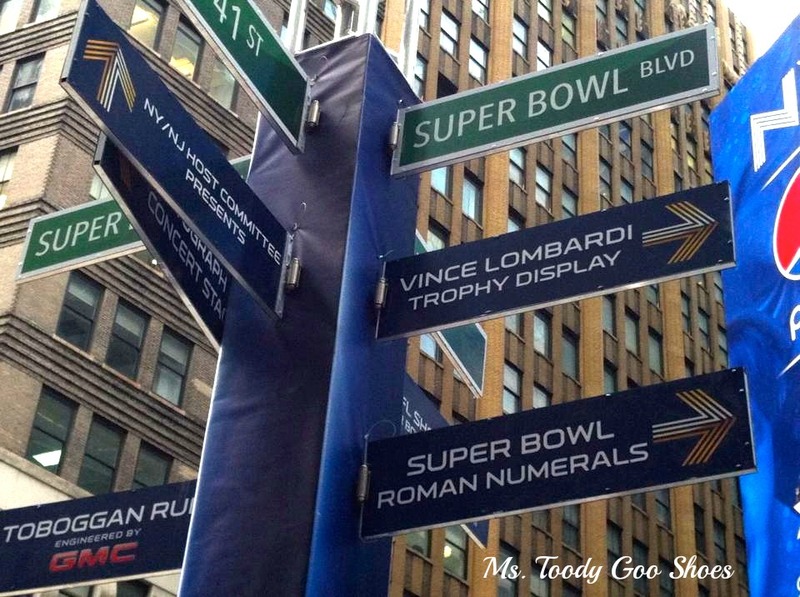 I am a HUGE football fan, so I do plan to watch the Super Bowl, even though my NY Giants had one of their Worst. Seasons. Ever. Who do you want to win -- Denver or Seattle? Guess I'll have to root for the "other" Manning, so I'm going with Denver. And as far as who I want to win the Giveaway? What is your dessert preference -- something chocolatey, cinnamony, or lemony? My ranking would be CinnamonyLemonyChocolatey. It's such a tough call that I had to make it one word. 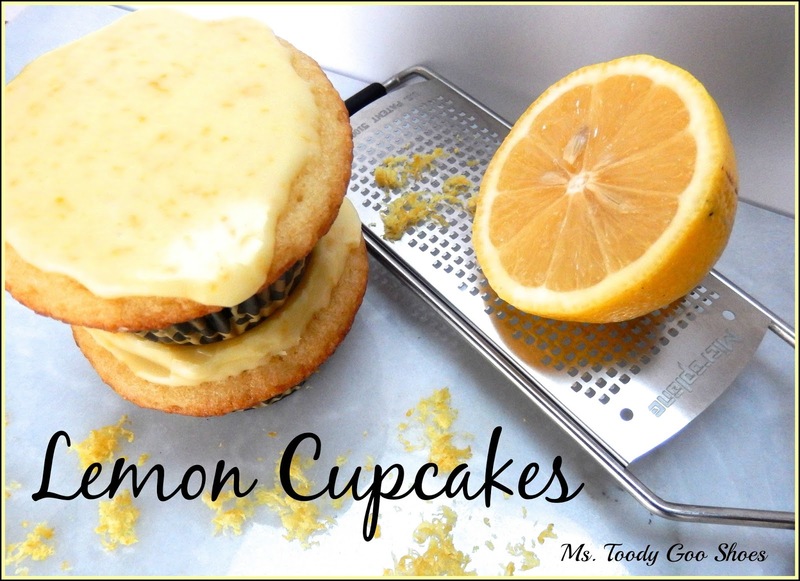 But cinnamon and chocolate are being cast aside today, because I've been in a lemon kind of mood. 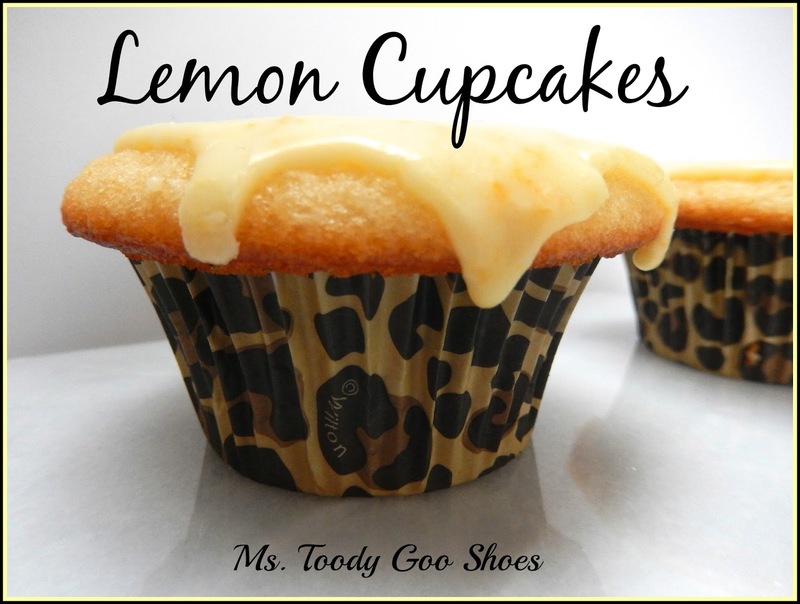 Not as in a sour mood...but a cupcake mood. I decided to make these little gems this past weekend, when my brother-in-law, niece and 16-year old great-niece came for brunch. I know, I know, I am not old enough (snort!) to have a great-niece, but hey, we're a modern family, what can I tell you? 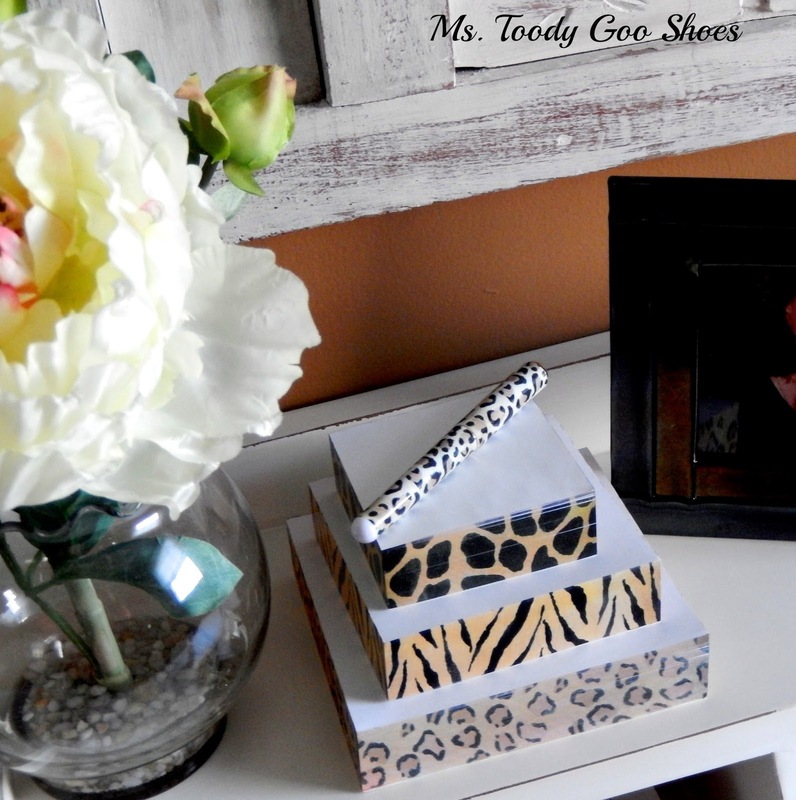 I didn't feel like a chocolate dessert, and I really wanted to use these fabulous animal print cupcake liners. So, yeah, I have to admit that I picked a dessert based on how they would look in these outfits. Little cupcake fashionistas, aren't they? Speaking of outfits...while we were enjoying some lemon cupcakes, we were talking about shopping for prom dresses, and how some stores keep track of who buys what dress to wear to which high school prom, so, heaven forbid, two girls don't show up wearing the same dress! 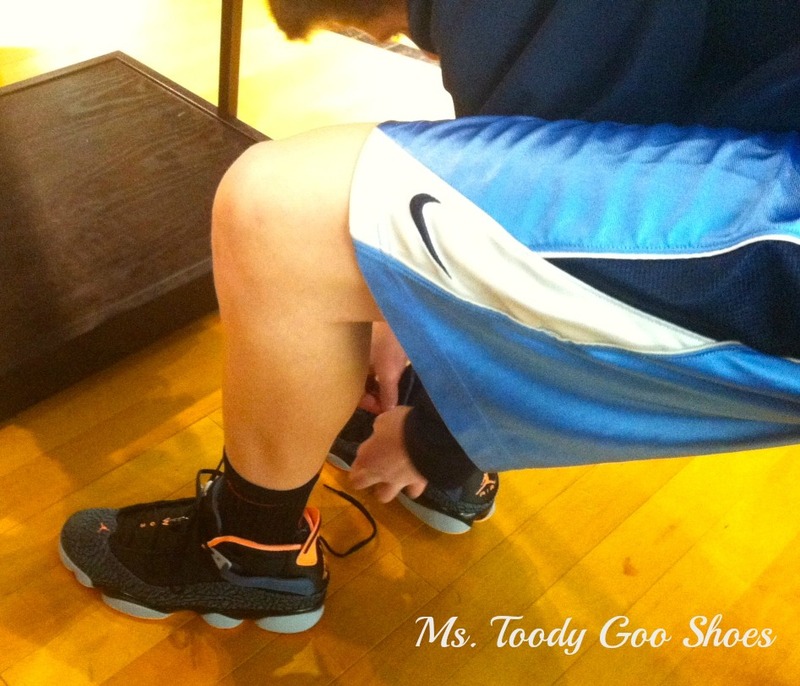 I never would have thought there was a "boy" equivalent to this, but I took Junior Goo Shoes shopping for sneakers this past weekend, and learned that it is an unwritten rule that you cannot buy the same sneakers as another boy in school. Unfortunately, sneaker stores don't have it quite as together as dress shops, so no lists are kept at Foot Locker saying, "A pair of red and black Jordan 5's was sold to a Freshman at BlahBlah High School." Nope, you just have to know that no one else has them. I'm sorry, but I just don't get the math. How can there possibly be enough different sneakers in the universe to avoid this teenage taboo? Junior Goo Shoes says, "Mom, you'd be surprised." And I am. But I digress. Back to the cupcakes. 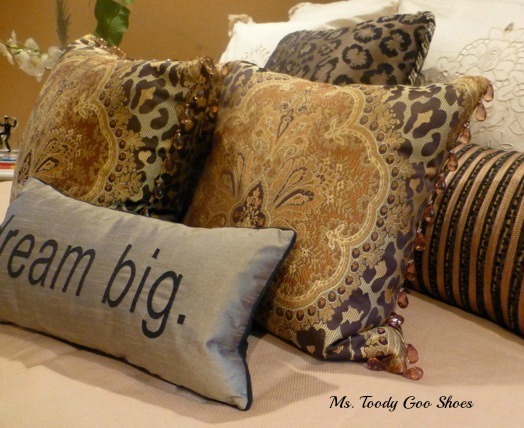 I have made these many times, and the note I wrote the first time I made them said "omg fantastic!" The recipe comes from the Flat Belly Diet Cookbook -- and they are sooooo good -- they are featured on the cover. Mine look almost as good as theirs, don't they? And, if I must say so, mine are better dressed! 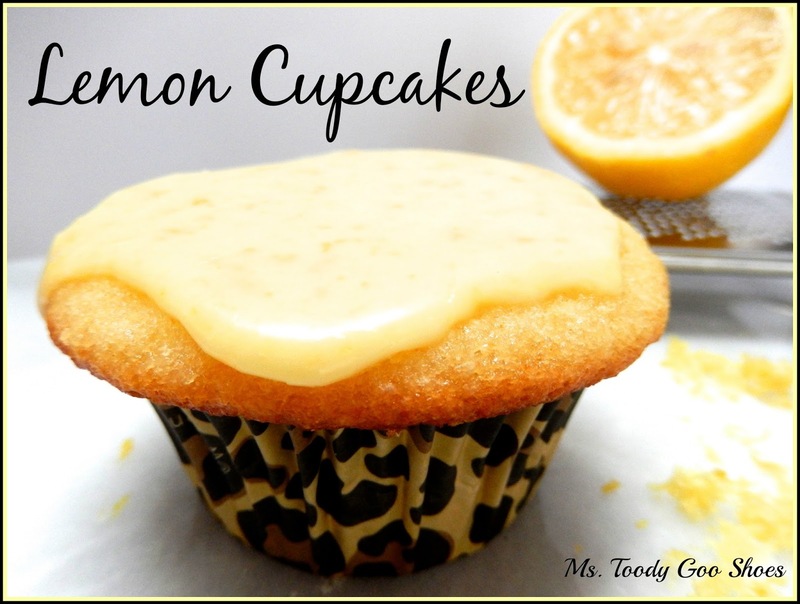 Now, don't go click away...these are not DIET cupcakes. They are pretty healthy, though, as cupcakes go. While we're on the topic of "healthy," my niece lives on a farm and writes a blog called Garden Spotlight about gardening advice, professional growers' tips, farming adventures and recipes. 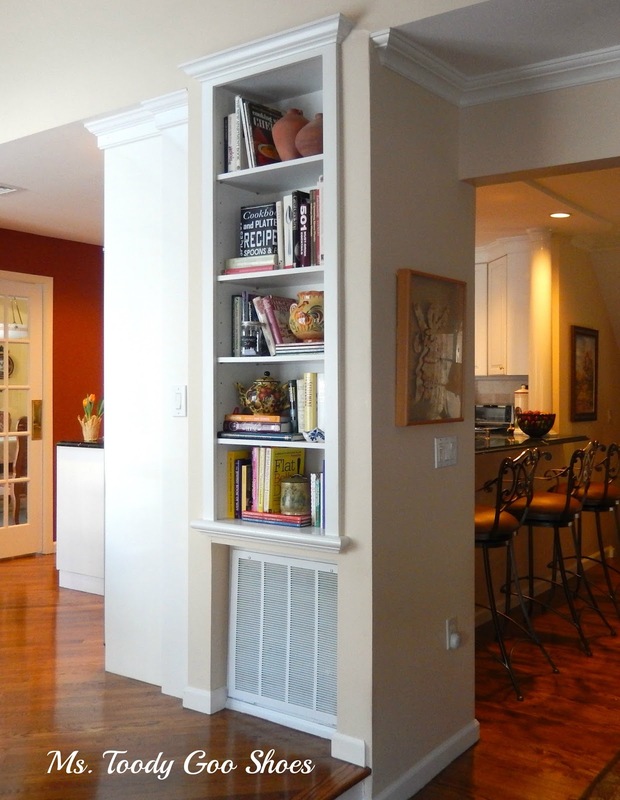 She is an amazing cook, and extremely knowledgeable about all things garden-related. Check it out, and leave her some comment love! Her daughter...my great-niece...has been blessed with the gift of an incredible singing voice, and is an up-and-coming country artist. You can see her perform here at a recent radio concert series on the Joe Daily Show. She has such poise for a 16-year old! I just had to give her a little plug (with her mom's permission, of course)! 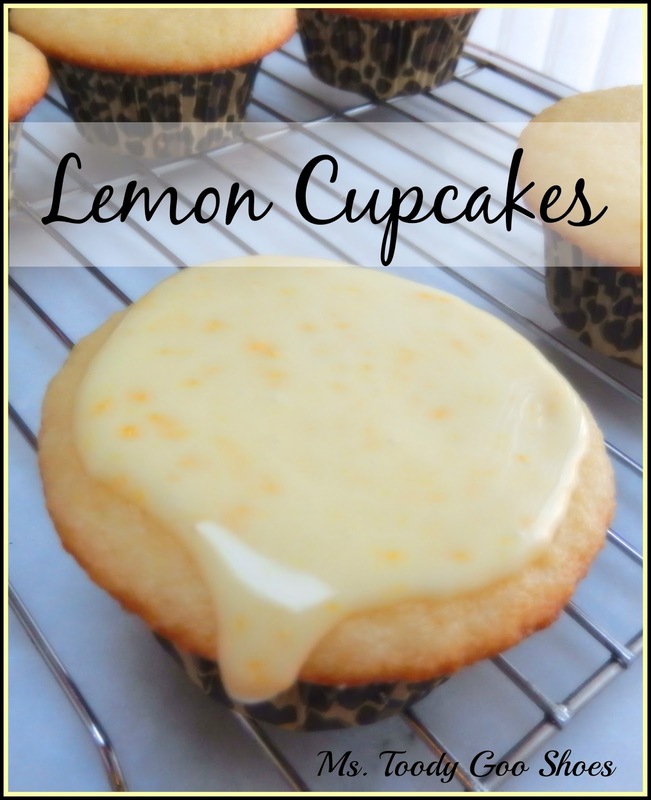 These lemon cupcakes are a beautiful thing, too. I can guarantee you will be singing their praises! Combine the oil, eggs, milk, lemon juice, lemon zest, lemon extract and vanilla extract in a separate bowl. 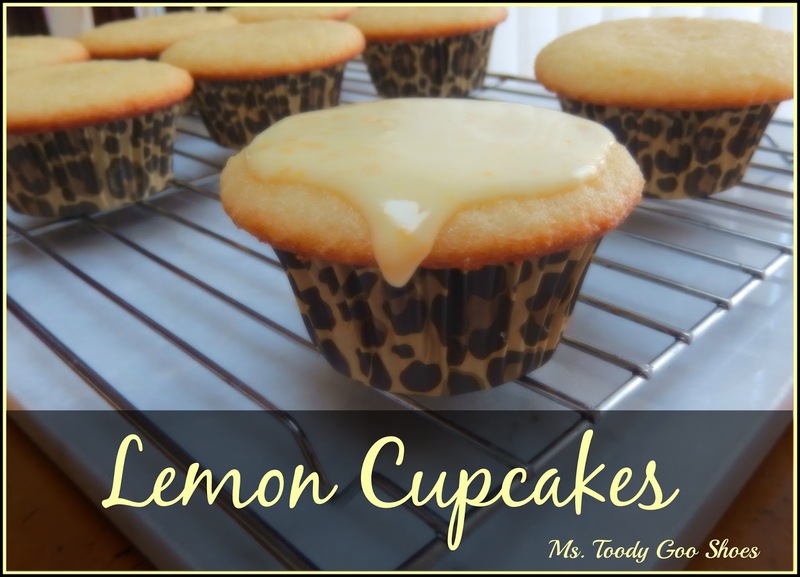 Spoon the batter into the muffin cups and bake for 17 - 19 minutes or until lightly golden and the cupcakes are springy when gently touched. Place the pan on a rack and let cool for 5 minutes. Remove the cupcakes from the pan, transfer to the rack, and let cool completely. Combine the confectioner's sugar, orange juice, and orange zest in a bowl and stir until smooth. 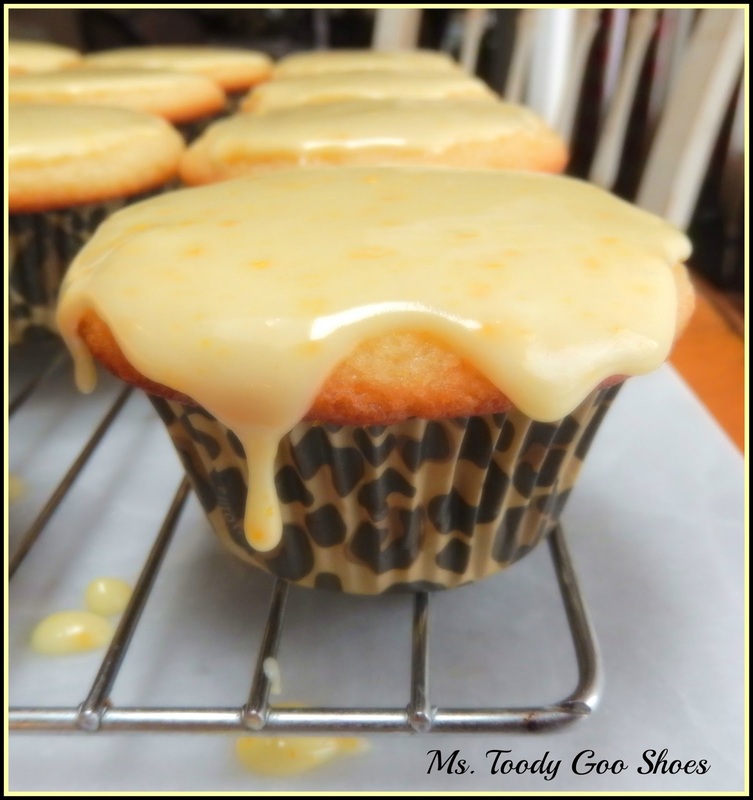 Spread some of the glaze over each cupcake with a small spatula and let stand at least 10 minutes before serving. *If needed, add a drop more juice to the sugar if it is too thick. Well, it started snowing again this morning. We're supposed to get between 8 and 12 inches. I had to cancel my dentist appointment, and lunch and dinner plans in NYC. Junior Goo Shoes is thrilled that they had a half-day today, and is hoping for a snow day tomorrow. Me? I've had enough of winter. 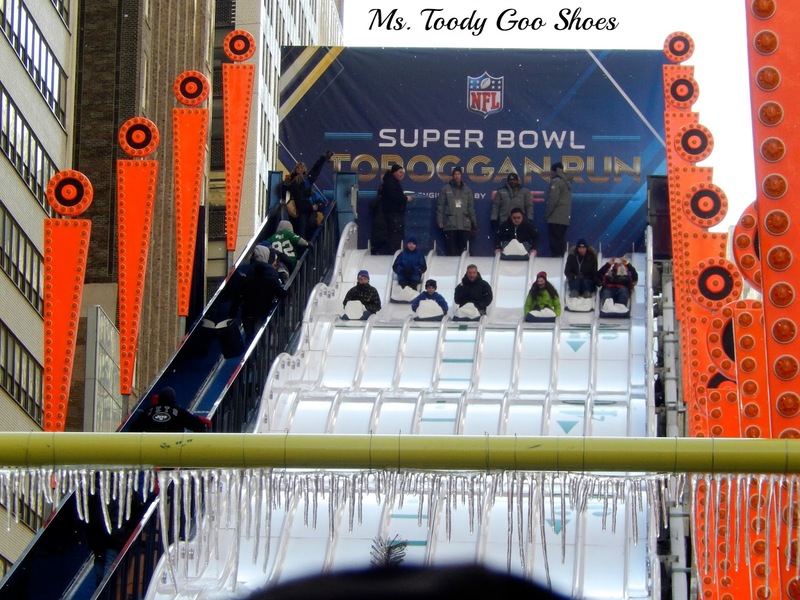 Mr. Goo Shoes is still having some back problems, but he may be able to manage the snow blower. I hope so...I am not up to shoveling the driveway again. 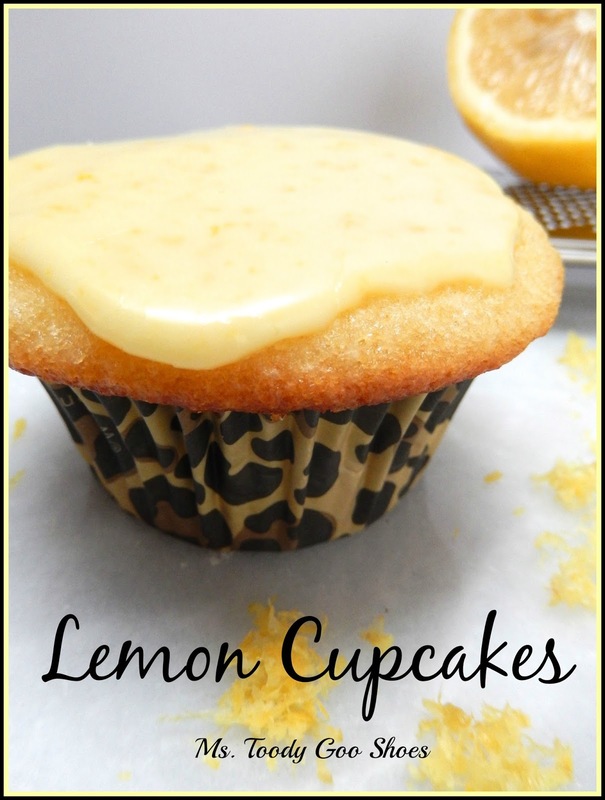 I'd much rather stay inside, eat a nice lemon cupcake, and catch up on all of your blogs. 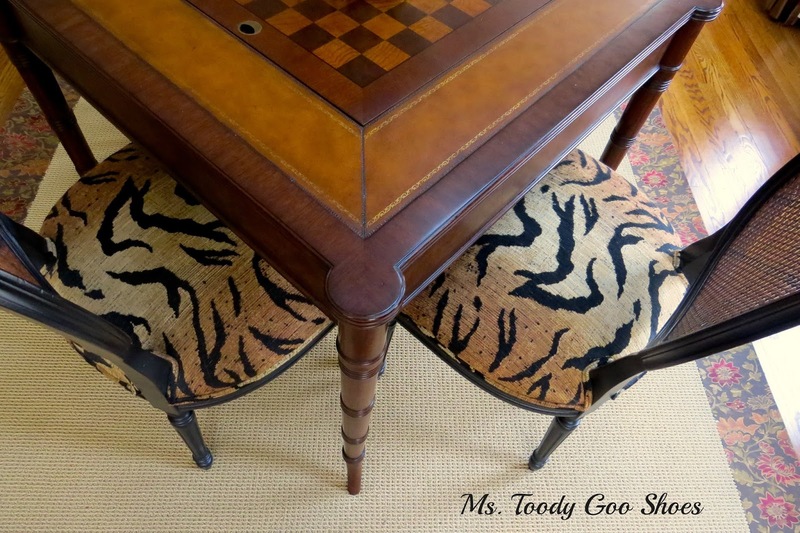 Do you find yourself attracted over and over again to the same color, fabric, texture? Me? 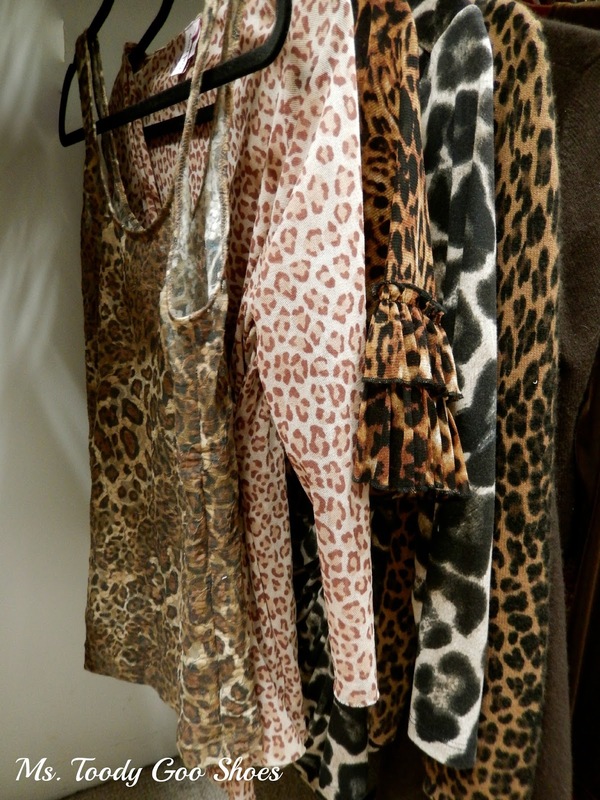 I'm attracted to animal prints. It's like a powerful magnetic force just pulls me towards them no matter where they might be hiding in a store. They call to me. And I usually answer. Ca-ching! There may be a scientific explanation for this. Seriously! The phrase "Animal Magnetism" was coined way back in the 18th century by a German doctor who believed animals gave off an invisible natural force, which could have physical effects, such as healing. I like to think of it as my very own version of pet therapy. 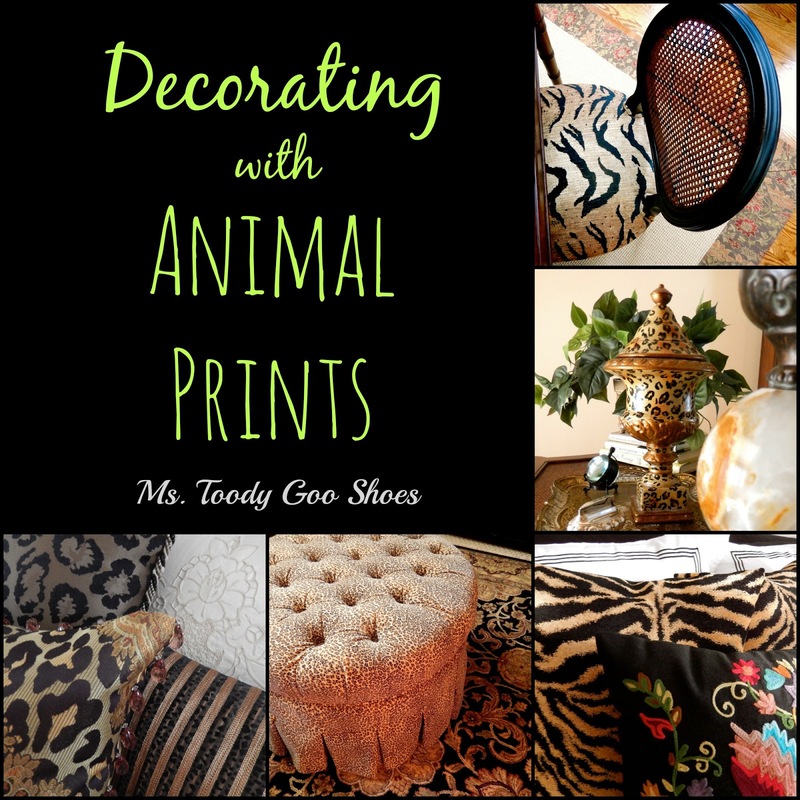 I've never met a room that clashes with animal prints, and I tend to use them as neutrals. 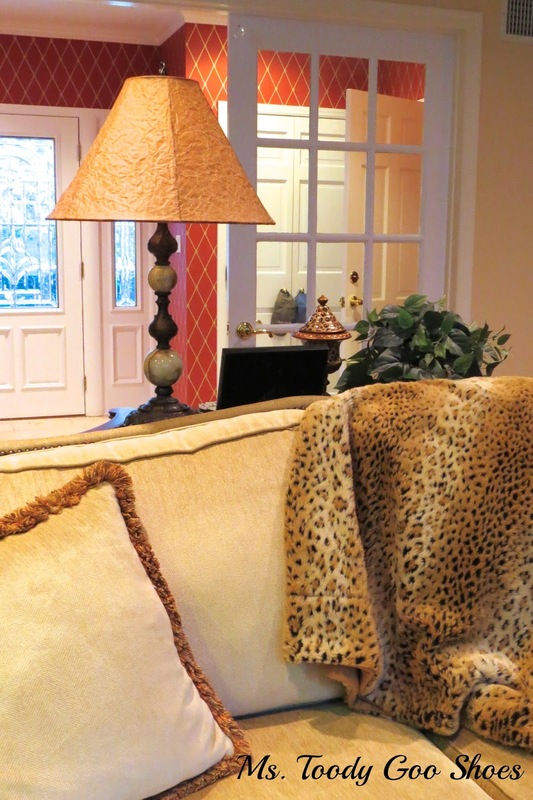 Whenever I add an animal print element, it brings an energy to the room. Of course, they need to be used in the right way...too much of a good thing, is no longer a good thing. You know what I mean...we've all seen someone in the mall wearing a leopard-print coat, cheetah print boots, and a zebra-striped scarf. No-no-no-no-no. 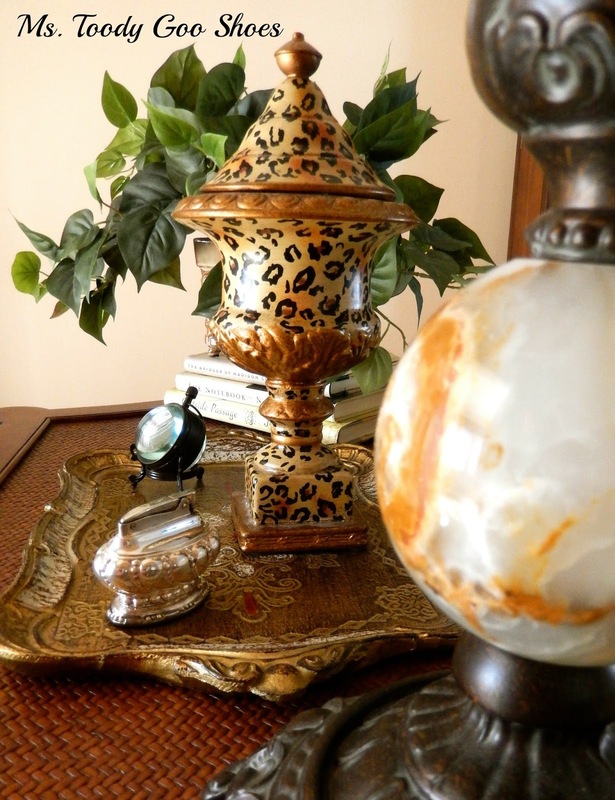 But as an accent piece? Oh yes. 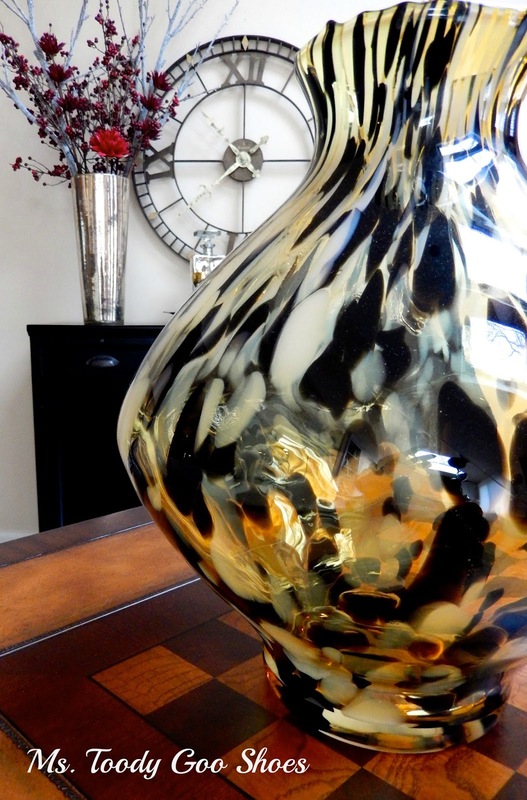 It's similar to the theory that we should always use a little black in every room. Maybe I went a bit overboard in this room. I'll move some to another room. They are neutral, after all. ...which is kind of like my house. 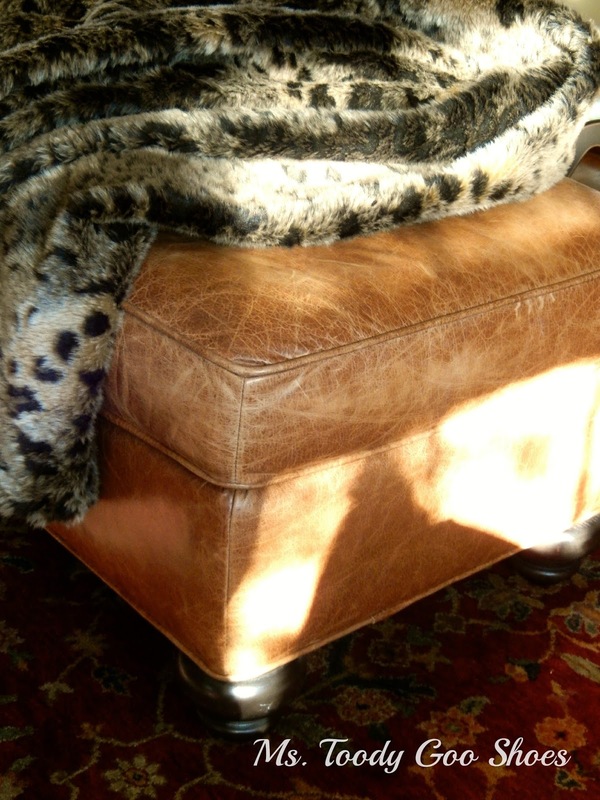 Almost all of my rooms have a little cheetah or leopard in them. I think they've grown on him. This chair is one of his favorites. 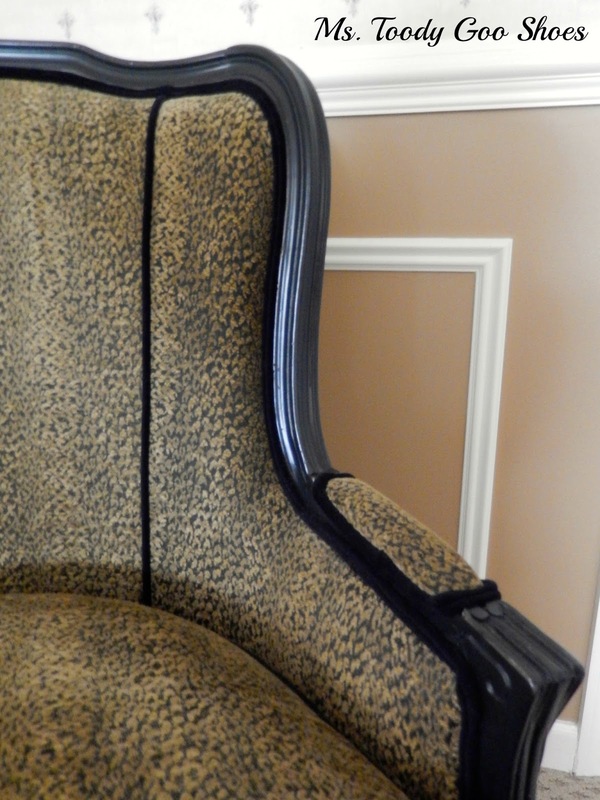 The animal print trend has been around for years, and I hope it never goes away. Not that I'll change my ways, even if they are no longer fashionable. 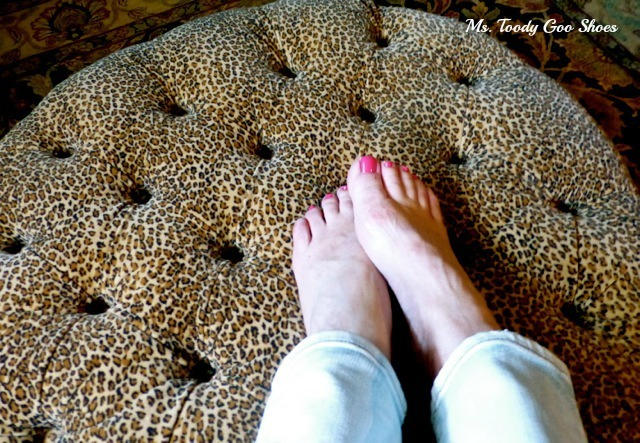 A leopard doesn't change it's spots, after all, and neither do I. Chocolate Cupcakes: The. Best. Ever.